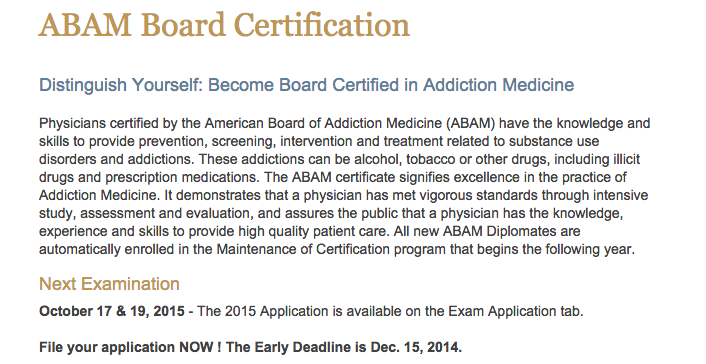 To make this point I sat for the 2010 American Board of Addiction Medicine Certification Examination. I did this to make a point–kind of like seeing how easy it is to buy a gun at a Walmart. I simply went to the ABAM Website, completed the application and paid the fee. The requirements to sit for the exam included so many “practice experience hours” over the past five years and 50 CME credits related to addiction. With a year of psychopharmacology research, a half-day per week moonlighting at the MBTA medical clinic giving drug tests to bus drivers and another overnight moonlighting job giving medical clearance to patients at a local psychiatric hospital detox unit I satisfied the first requirement. For the latter I looked through the last five years of morning reports, noontime lectures and grand rounds I went to and added them up and, falling a little short supplemented the CME credits with some online modules. And with that I was given a date at Pearson to take the test. 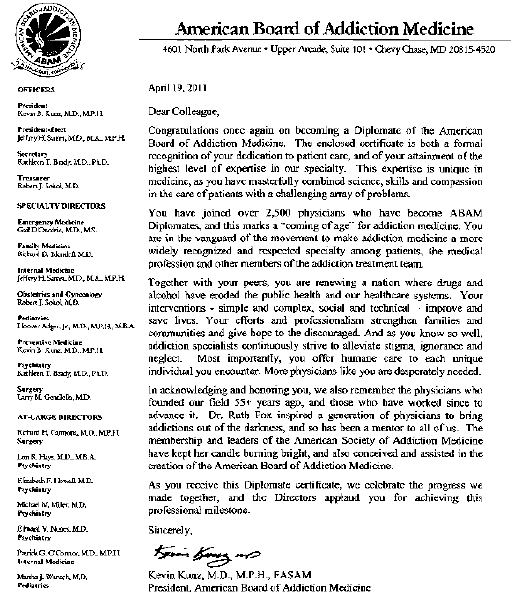 I have absolutely no training or education in the field of addiction medicine. I didn’t pick up a book or study anything. I did not prepare at all. I did not even get a good night’s sleep the night before and stayed up until 2:30 a.m. Nevertheless I went to the testing facility the next morning and finished the test within an hour and a half. My score is below. Aced it. Passing score was 394 and I got a 459. And the point I am trying to make is I am no expert in Addiction Medicine. Neither is 4000 of me. Yet the letter below says I am. Majority apparently rules. Giving false expertise to the unqualified and granting them power over others is just as dangerous as the gun from Walmart. They can both kill. An interest in something does not an expert make. If we allow this then the ASAM 12-step chronic brain disease model not only swallows addiction medicine but tarnishes all of medicine. An imposition by force and the deep pockets of the billion dollar drug and alcohol testing, assessment and treatment industry. ASAM is not a true medical specialty. 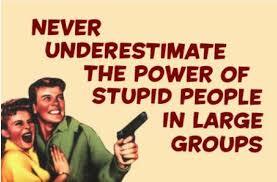 It is a special interest group. ABAM is not recognized by the American Board of Medical Specialties (ABMS). 2) There are not enough Addiction Psychiatrists to diagnose and treat them. 3) Being an M.D. addict or alcoholic gives enough knowledge and apprenticeship skills to diagnose and treat others with the same affliction. 4) Let’s utilize them to fill the void. This is logical fallacy and it is dangerous. An interest in something does not an expert make. 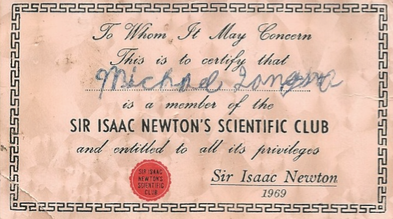 I had an interest in science as a child but my certification as a member of Sir Isaac Newton’s Scientific Club did not make me a scientist. I received my ABMS certification without meeting a single person. It was all done by mail. This fits the very definition of “Diploma Mill.” This is not to besmirch those with a sincere interest in helping others with addiction. Many if not most of those involved are sincere. But this is not expertise. This is not authority. And, as we have seen, this low bar opens the door for some very bad apples. “This election is not about issues,” Rick Davis, John McCain’s campaign manager said this week. “This election is about a composite view of what people take away from these candidates.” That’s a scary thought. For the takeaway is so often base, a reflection more of people’s fears and insecurities than of our hopes and dreams. — Re: This diploma took me longer (a whole day). It is harder to get a certification as a Doctor of Mixology than a certificate of the American Board of Addiction Medicine. I have a big problem with your criticism of the ABAM. You imply that it was easy for you to obtain your certificate because sitting for the exam required only “…so many “practice experience hours” over the past five years and 50 CME credits related to addiction” and that you finished the exam after only an hour and a half. You malign the field of addiction medicine and those attempting to gain it recognition within the medical profession and society as a whole. The fact that you chose not to in good faith educate yourself and were able to pass the exam anyway speaks more to your lack of character and commitment than anything else. 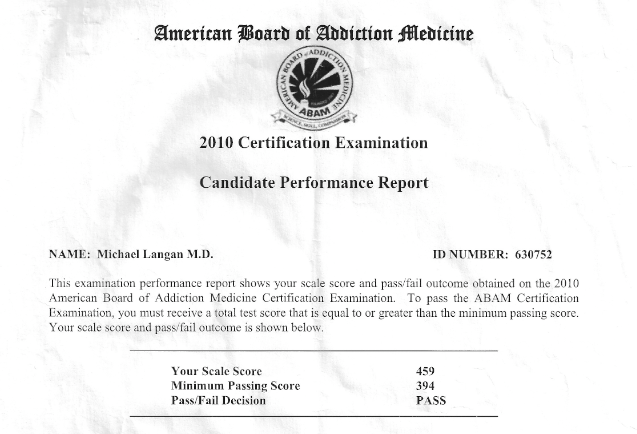 I am certain that the vast majority of addiction medicine specialists take their profession very seriously and, unlike you, dedicate themselves to furthering their knowledge and understanding of addiction, rather than simply trying to prove a point that they are good exam takers. Addiction is a serious problem. Your decision to attack those who are trying to advance the field of addiction medicine by putting together a process to obtain board certification is unfortunate and ignorant. I am far from a 12 step zealot. On the contrary, I have long been critical of the fact that many in the addiction medicine community see the 12 step program as the only option..
Ah, then if that is the case would you mind sharing with us your full name? I am requesting this because many of those involved in the testing, assessment and treatment racket claim the same thing. 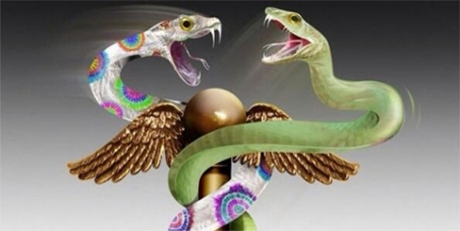 If you have long been critical of the addiction medicine community seeing the 12-step program as the only option you should have no trouble with full disclosure. I would but unfortunately I fear the wrath of my licensing board. While I feel it is unfair to label all addiction medicine physicians as being unethical or involved in racketeering as you put it, I agree that there are those who abuse their authority and the conflict of interest inherent in professional monitoring programs. It’s very common for people to become overly zealous when it comes to something as important and potentially life saving as recovery from addiction. The dogmatic approach inherent in PHPs is, I believe, a better option than license revocation. The addiction medicine community has been successful in convincing the licensing boards that participation in and compliance with the terms of PHPs, which include a requirement to attend 12-step meetings, get a sponsor, etc., allows health care professionals to practice safely and gives them the best chance for long term recovery. Until a more effective, proven method of addiction recovery emerges, which to the best of my knowledge has not yet happened, I have resigned myself to the idea that it is a necessary component of my career and have become more accepting. That stated, I believe the field of addiction medicine is really in its infancy. As the neurobiology of addiction becomes better understood, new and more effective treatments will emerge, treatments that target addiction at its most fundamental level…the midbrain. Once that occurs, the 12-step approach may go the way of bloodletting or leeching. Those are powerful words spoken by a powerful man with powerful dreams and powerful nightmares.